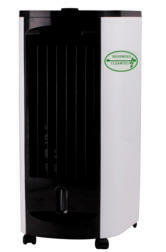 eStore CLEAN AIR AND WATER PRODUCTS 3-IN-1 COOLER AIR PURIFIER AND HUMIDIFIER Product designation: B-CAP31-4-300-70W Description: This clean air product is an energy efficient air conditioner which combines the cooler, air purifier and air humidier to a single elegant compact portable air conditionner suitable for residential and commercial applications. It is designed to purify air by removing dust and unpleasant odors in the room while improving health and comfort. Adding ice to its water tank will provide an additional cooling down to 3˚C. Its water tank provides moisture to protect skin for dryness. Supply Voltage: 120 V - 60 Hz Rated Power: 70 W Electrical Protection Class: II indoor Air Flow Volume: 300 m³/h Anion Production: 2 millions/cm³ Water Tank Capacity: 4 l Net Weight: 6 kg Size: L292 x W232 x H670 mm Warranty: 1 Year Certification: ITEM PRICE contact sales@bouendeu-cleantech.com 4-IN-1 COOLER AIR PURIFIER, HUMIDIFIER AND HEATER Product designation: B-CAP41-5-300-70W-2kW Description: This clean air product is an energy efficient air conditioner which combines the cooler, air purifier and air humidier and heater to a compact portable air conditionner suitable for residential and commercial applications. 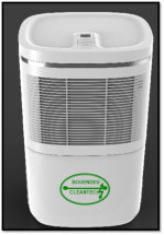 It is designed to purify air by removing dust and unpleasant odors in the room while improving health and comfort. Adding ice to its water tank will provide an additional cooling down to 3˚C. Its water tank provides moisture to protect skin for dryness. Supply Voltage: 120 V - 60 Hz Rated Power: 70 W & 2 kW (heating) Electrical Protection Class: II indoor Air Flow Volume: 300 m³/h Anion Production: 2 millions/cm³ Water Tank Capacity: 5 l Net Weight: 7.5 kg Size: L336 x W250 x H657 mm Warranty: 1 Year Certification: ITEM PRICE contact sales@bouendeu-cleantech.com MULTI-PURPOSE CLEAN WATER IONIZER Product designation: B-CWI-80W Description: This clean water product is an energy efficient lightweight durable multi-purpose clean water ionizer which is used at home and office to produce potable alkaline water for drinking, making tea, cooking foods, purified water for taking medecines, acidic costmetic water to cleaning your face and shrinking your pores and acidic sterilized water to gargle and wash tableware. 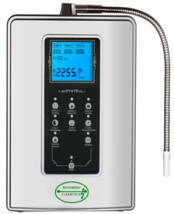 It is equiped with a dynamic LCD screen, fashionable touch panel and a micro-processor which controls the electroysis process, making the machine adaptable to all kinds of water with TDS between 100 and 1000 ppm. The data of the PH and OPR are automatically displayed on the LCD screen, helping the users choose different kind of water correctly depending on the application of the water. This machine is a Must for your health and the health of your family. Working Time for Continuous Electrolysis: 30 min Max. Temperature of Water Inflow: 5-40˚C Supply Voltage: 120 V - 60 Hz Electrolysis Power Range: 10-80 W Standby Power: 1.5 W Pressure of Power Inflow: 0.1-0.3 Mpa TDS of Water Inflow: 100-1000 mg/l Flow Rate: 1-4 l/min Net Weight: 4.2 kg Total Electrolytic Volume 12000 l Size: L292 x W139 x H390 mm Warranty: 1 Year Certification: ITEM PRICE contact sales@bouendeu-cleantech.com .